When PMG first agreed to participate in the DMAW Educational Foundation’s (DMAW/EF’s) Mentor-for-a-Day program, we saw it as a way to help support the organization and give college students a glimpse into the everyday world of direct response marketing. Now — four years and three very successful hires later — we have figured out that it was the DMAW/EF and the schools who were doing us a huge favor! Our business model has typically relied on hiring individuals with at least five years of experience in some aspect of direct response. Some of our team come from print and mail shops, others from creative agencies or data processing firms; it had been many years since we hired right out of school. That all changed when our first DMAW/EF Mentor-for-a-Day student, Danielle Hart from Salisbury University, came to the office. We were so impressed with Dani’s poise, knowledge, and enthusiasm that we offered her a summer internship. And that internship turned into an offer of a full-time position which, thankfully for us, Dani accepted. The next year – same song, different student. Leigh Ann Doyle, also from Salisbury, came for a day, then a summer, then part-time until we could figure out how to afford her full-time. She has now been with our production team more than two years, and we hope for many more! Last year, yet another Salisbury student came for the day, came back for the summer and now, Leslie Nielsen is working here full-time with our digital group. We did lose Dani last year to the West Coast and a credit counseling firm offering new direct response opportunities. But wait — fast forward to this fall — and guess who contacted us to help her company with its direct mail program? If you said our former employee, Dani Hart — now a brand new PMG client — you got it right. So, here’s the moral of the story. We thought we were doing a good deed by helping the DMAW/EF in its mission of expanding direct response opportunities for college grads. Instead, it turned into a great way for PMG to find talented new team members and — oh, by the way — a brand new client! Thank you, DMAW Educational Foundation, and count us as one of your enthusiastic supporters. 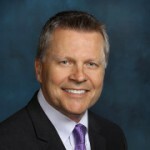 Rick Powell, the current President of the DMAW Educational Foundation, is the Founder and CEO of PMG, a full-service direct marketing production management firm. In 2015, Rick was inducted into the DMAW Hall of Leaders. Rick can be contacted at PMG at (410) 290-0667 or rick@pmgdirect.net. For more information about the DMAW/EF, visit www.dmawef.org.